Recycling helps create the products we use everyday-from soda containers to writing paper, carpet, and automobiles. Recycling mines valuable materials out of garbage to make new products. That’s what makes it one of the oldest environmental practices and one of the most beneficial. Conserves natural resources to help sustain the environment. Saves energy and prevents pollution caused by the extraction and processing of virgin materials. Get more financial and environmental benefits of recycling . American communities recycled and composted nearly 30% of municipal solid waste in 2001, diverting 68 million tons to recovery. What got recycled? sumers purchase products and packaging with recycled content. Paper recovered for recycling has increased almost 100% since 1987. In 2002, Americans recycled 47.6 million tons, a little over 48% of all paper consumed in the US. Newspapers – 71% of all newspapers are recovered for recycling. Over a third goes back into making more newsprint. The remainders is used to make paperboard, tissue, and insulation, or exported. Boxes – 74% of boxes, or corrugated containers, are recycled. About 64% are recycled into new boxes. Another 17% are used for paperboard packaging, like cookie and cracker boxes. 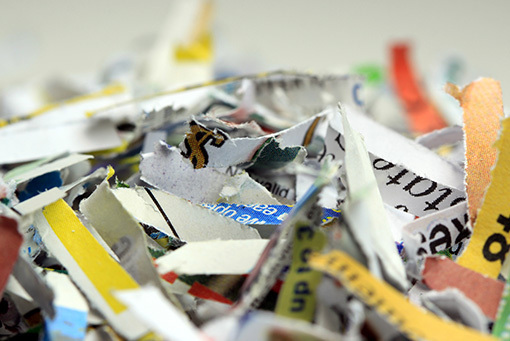 Office Paper – Nearly 46% of office papers are recovered for recycling. These become raw material for paperboard, tissue, and printing and writing papers. Recovered paper accounts for nearly 38% of fiber used to make new paper products. While paper fibers cannot be recycled forever, paper is made from a renewable resource, trees. After achieving nearly 50% recovery, the paper industry has set a new, higher paper recovery goal of 55% by 2012. The industry expects an increased demand for recycled paper both overseas and in the U.S. More on paper recycling . Recovery of aluminum for recycling has dropped from a high of 68% in 1992 to just over 53% in 2002. While aluminum recovery has fluctuated, it has a long history of recycling primarily because recycled aluminum provides significant energy savings compared to the use of virgin raw materials (mainly the ore bauxite). Although aluminum is a nonrenewable resource, it can be recycled indefinitely. Recycled cans are melted into ingots weighing up to 60,000 pounds-enough aluminum to make 1.6 million new cans. It takes 60 days for a can to journey from the recycling bin through the recycling process and back on store shelves. Recycling aluminum saves 95% of the energy needed to produce new aluminum from raw materials. Energy saved from recycling one ton of aluminum is equal to the amount of electricity the average home uses over 10 years. The value of aluminum also typically covers the cost for its collection and reprocessing. Recyclers paid nearly $1 billion for aluminum beverage cans in 2002. Besides cans, other aluminum products that can be recycled include foil wrap, food cans, pie plates, frozen food trays, lawn chair tubing, storm door and window frames, residential siding, and auto parts. Get more facts . 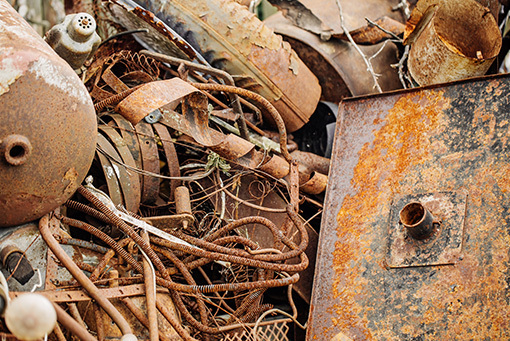 The steel industry recycled nearly 68% of steel scrap from recycled cans, automobiles, appliances, construction material, and other steel products in 2001. Some communities even recycle empty aerosol cans. Recovered steel is remelted and used to produce new steel products. A minimum of 25% recycled steel goes in to packaging, car bodies, appliances, and steel framing. Products such as railroad ties and bridge spans use virtually 100% recycled steel. 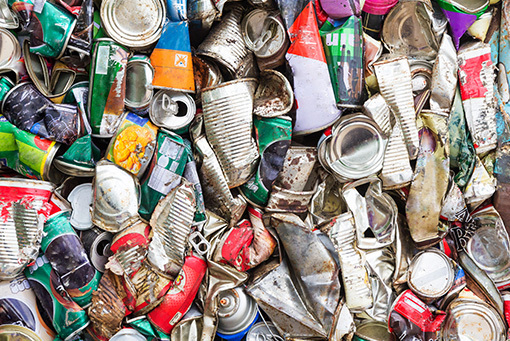 Cans – 58% of steel cans were recycled in 2001. More than 200 million Americans have access to steel can recycling through curbside, drop-off, and buy-back programs. Appliances – In 2001, 85% of steel from appliances were recycled at nearly 12,000 appliance recycling locations in the U.S. Automobiles – More than 14.5 million cars were recycled in 2001, a little more than the number of new cars produced. Construction – It is estimated that half of all steel used to reinforce buildings and 95% of structural beams and plates are recycled. Learn more from the Steel Recycling Institute . Plastic products account for 11.1% of all municipal solid waste generated in the U.S. In 2001, 5.5% of it was recovered. About 10% of plastic containers and packaging were recovered, mostly soft drink, milk, and water bottles. Two of the most widely used forms of plastic, PET (Polyethylene termpephthalate) and HDPE (high density polyethylene), are also the most recycled. PET bottles (soda, water) and HDPE bottles (milk, laundry detergent) are commonly collected in community recycling programs. 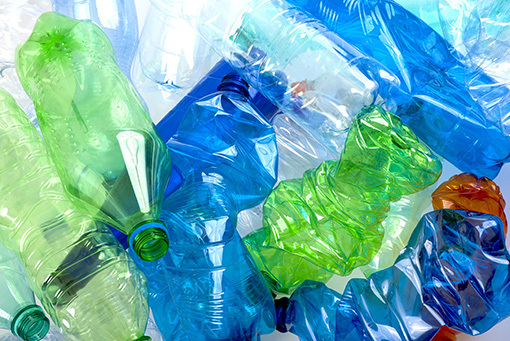 In 1999, 23.8% of HDPE and 22.8% of PET bottles were recycled. Most of the PET bottles (56%) are used in the manufacture of fiber for carpet and clothing. And, 29% of HDPE bottles go back into making new bottles. In 2001, more than 452 million pounds of polystyrene were recycled back into foam egg cartons, lunch trays, transport packaging, and audio and videocassette cases. Polystyrene foodservice packaging (like clamshells) is not generally recycled because it is not economically sustainable. Polystyrene, HDPE, PET and other varieties of plastic all have different properties, so they must be separated to be used as a raw material for new products. The differences between varieties of plastic may not be readily apparent when comparing containers visually. To help consumers assess the type of plastic, the society of the Plastics Industry developed a uniform coding system which identifies the type of resin used in plastic packaging (like bottles, packages, etc.). These “plastic codes” now appear on most forms of plastic packaging. Glass that has been collected for recycling is called cullet. Glass container manufacturers recycle cullet, combined with soda ash, limestone and sand, to create “new” glass. In 2001, glass made up 5.5% of the municipal solid waste stream by weight, and of that, about 22% of glass containers were recycled. 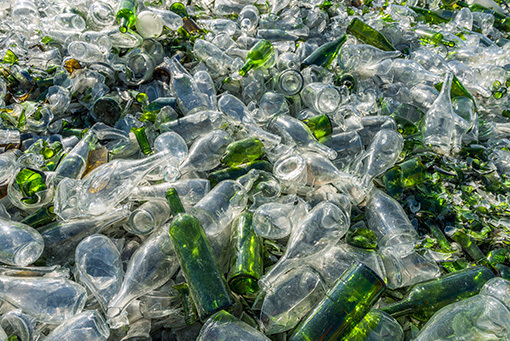 Using recycled glass to make new glass packaging reduces consumption of raw materials, extends the life of plant equipment, such as furnaces, and saves energy. It is best to sort glass by color (clear, green, and amber), as mixed glass has little or no value to container manufacturers. Materials to keep out of the glass recycling mix includes ceramic cups and plates, clay pots, drinking glasses, light bulbs, and mirror and window glass. These items are not recyclable and contaminate a batch of cullet. About 281 million scrap tires were generated in 2001, around one tire for every American. There are at least another 300 million scrap tires in stockpiles in the U.S. according to the U.S. EPA . Tires represent 1.8% of solid waste generated. Finding a market for scrap tires has been a persistent problem. In 1990 markets existed for only 17% of scrap tires. Today, there are markets for almost 78% or 218 million tons. The rest are stockpiled or landfilled. Many states restrict them from landfills, which has encouraged the development of new uses for scrap tires. To date, 30 states collect disposal fees on tires to help fund scrap tire management and market development. 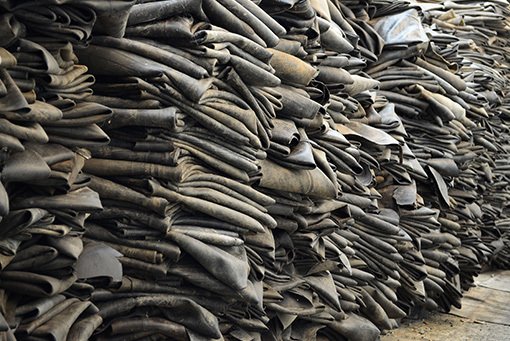 According to the Rubber Manufacturers Association , in 2001, 33 million scrap tires were recycled and used in rubberized asphalt, 40 million were used as an alternative to rock in civil engineering projects, and 115 million for fuel in cement kilns and pulp and paper mills. The rest were exported or stamped into new products. To keep your tires out of the waste stream, consider retreading them. Cell phone use has grown from 340,000 in 1985 to 128 million in 2001, according to a study by the environmental research group, INFORM.. Most phones are used an average of 18 months before being replaced. The study estimates that by 2005 about 130 million cell phones, weighing approximately 65,000 tons, will be discarded annually in the U.S. Before being disposed of, many will be stashed in homes and offices, creating a stockpile of roughly 500 million wireless phones. A typical wireless phone consists of 40% metals, 40% plastics, and 20% ceramics and other trace materials. Much of this is recoverable, including the batteries. Wireless phones also contain a number of toxic materials, such as lead and brominated flame retardants, which are released into the environment when they are disposed of in a landfill or incinerator. 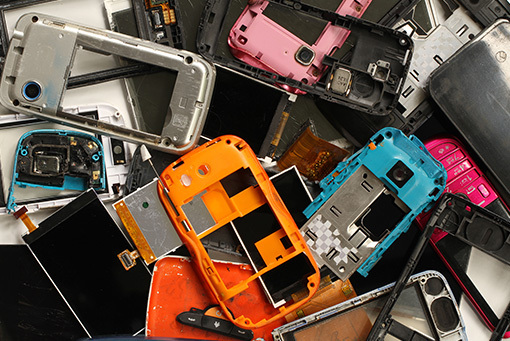 The Cellular Telecommunications & Internet Association is helping establish cell phone recycling. AT&T Wireless accepts cell phones and accessories, regardless of the manufacturer, at any AT&T Wireless retail store for recycling. Charitable Recycling for Cell Phones. The U.S. EPA estimates that more than 3.2 million tons of electronics are landfilled each year. Computers are typically discarded about every 3 to 5 years. By 2005, nearly 250 million computers are expected to become obsolete. In 2001, 11% of personal computers were recycled, including recovery of steel, glass, plastic, and precious metals. 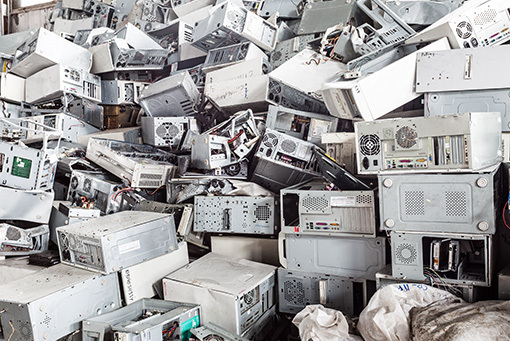 According to E-Scrap News, more than 1,000 U.S. communities now provide some kind of electronics recycling (periodic events, drop-off, or door-to-door collection). Communities may charge a collection fee. About 50 new e-scrap processing firms were established in the U.S. in 2003. According to the International Association of Electronics Recyclers e-scrap reclaimers employ 7,000 in processing 40 million electronics products annually. Get ” Ten Tips for Donating your Computer “. Get information on the U.S. EPA’s Plug in to E-cycling campaign . For consumer information on electronics recycling and reuse opportunities, visit theConsumer Education Initiative . Dell and Best Buy have also established electronics collection programs. costs to collect and transport recyclables from households, schools, businesses, and institutions represent the bulk of recycling costs. These are generally paid by taxes, fees, or subscription charges. To offset these costs, communities may not collect items they can’t easily market, reduce the number of collection days, employ different or fewer collection vehicles, or change the method of collection. See “recycling collection trends” below. Once recyclables get to the materials processing facility (called a “MRF”), they must be separated to remove contaminants, sorted, and baled. Processing recyclables is costly and critical to ensure a high-quality, marketable end products. Many recyclables are sorted by hand as they go along a conveyor belt. But some products can be processed using magnetic separators, screens and eddy current separation. The market value of recyclables is significantly reduced when they are “contaminated” by food, hazardous materials, dirt, broken glass, and other unrecyclables. Materials may also be contaminated if they are mixed with other types of recyclables. Removing contaminants also raises processing costs. This is why there are local guidelines for what materials are collected and how they are “set out”. More on recycling and contamination see “recycling and contamination” below. Like any commodity, the supply and demand for recovered materials fluctuates. Variables that impact recycling may include recovery and processing costs, consumer demand, product quality requirements, and the price differential between recycled and virgin materials. The import and export of products and packaging, like corrugated boxes, also affects the supply of materials available for recycling in the marketplace. On a local level, the value of materials collected for recycling vary based on the variables described above, as well as local economics. For example, the cost of transporting recycled materials to manufacturers interested in buying them to make new products may not make economic sense. Or, collecting and processing a material for recycling may cost more than a manufacturer would be willing to pay for it. Consumers also play a role in the demand for products which use recycled materials. Learn more about buying recycled . Recycling adds value to the U.S. economy. According to a U.S. Recycling Economic Information (REI) study, funded through the U.S. EPA, the recycling industry comprises about 56,000 establishments that employ over 1.1 million people. These businesses generate an annual payroll of nearly $37 billion, and gross over $236 billion in annual revenues. Curbside means that recyclable materials are regularly collected from each home at or near “the curb”. What materials are collected, and how they are contained and “set out” is determined by each city or county program. In 2001, about half of the U.S. population was served by over 9,700 curbside collection programs, an increase of about 5% since 2000. Single-stream is the latest collection trend. It means recyclables are set out for collection commingled in one container rather than separating recyclables in two or more containers. Some industries, such as paper manufacturers, have concerns that this type of collection increases the likelihood that recyclables will be “contaminated” with food, dirt, hazardous materials, broken glass, and other nonrecyclables. Glass manufacturers are also concerned about contamination and glass breakage. A few communities that use single-stream collect glass separately from the commingled recyclables. Communities may choose this option because it is simpler for residents, which may increase participation and the amount of recyclables collected. This collection method, however, usually increases contamination [link to “recycling and contamination”]. Communities are still determining whether it is cost effective. Learn more. Drop-off or “convenience centers” are locations in a community where recyclables are accepted for collection. Residents are responsible to take materials to these facilities. Communities that have curbside collection may also have drop-off for certain types of recyclables. Learn more about the value of drop-off recycling. One-time events or recycling drives are annual or periodic collection events for recyclables such as electronics, paint, household hazardous waste, and phone books. Buy-back programs are those where residents receive cash or vouchers that can be redeemed at retail stores in exchange for specific recyclables. For example, manufacturers may want old appliances, toner cartridges, or other items for which they will pay a specified amount. In some cases, such as the Chicago Public Housing Buy-Back Recycling Program, residents collect many types of recyclables and are paid market value for these materials. Refundable deposit programs , sometimes called “bottle bills”, are in place in 11 states (CA, CT, DE, HI, IA, ME, MA, MI, NY, OR, VT). Materials like plastic, glass, and aluminum are collected for recycling through a refundable deposit program. Essentially consumers pay a deposit on designated beverage containers at the time of purchase (typically 5 or 10 cents). The deposit is refunded when containers are returned to an appropriate outlet, such as a retailer or a buy-back center. For recycled materials to compete with products made from natural resources like petroleum or trees, they must measure up in terms of quality, performance, and economics. This is much more difficult when recycled materials are contaminated with even small amounts of residue. While most recyclables are processed to remove contaminants, large amounts still make their way to the manufacturer creating costs along the way. In some manufacturing processes, such as paper recycling, even small amounts of contamination (adhesives, broken glass, dirt, etc.) may ruin an entire run, cause machinery to breakdown or to wear out. Contamination is also a concern in glass recycling. While processing equipment at a materials recycling facility (or “MRF”) can remove some contaminants from glass, ceramics (clay coffee-mugs, plates, dishes, etc. ), which are not easily removed, can ruin a batch of cullet. Contamination is the reason many communities are strict about what materials are accepted in a recycling program and how these materials are to be prepared for collection. Increased contamination lowers the value of recyclables, increasing costs and decreasing revenues for communities. 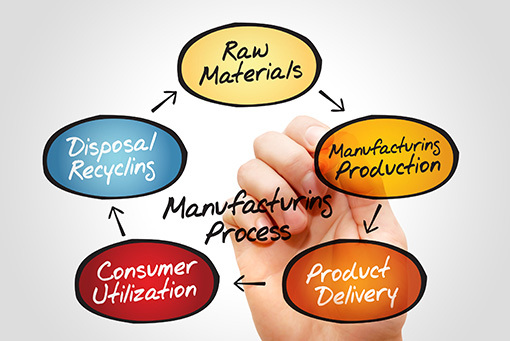 Buying recycled is often referred to as “closing the loop”. When consumers purchase products or packaging made from recycled materials they help to encourage a market for those products. Local, state, and federal governments may promote buying recycled products through purchasing programs and “green” guidelines. Products and packaging that contain recycled materials often indicate this on the label or display the recycling symbol . Many everyday products, however, do not carry the symbol, but still contain recycled content. The U.S. EPA estimates there are 4,500 recycled-content products available. These include items like cereal boxes, paper towels, carpeting, aluminum cans, newspaper, glass containers, detergent bottles, and motor oil. Learn more about identifying recycled-content products.